We’re going to be talking about plane crashes, obviously. If you’re particularly saddened by news of the recent crash of Germanwings Flight 9525 into the French Alps (and I can’t blame you if you are), you may wish to scroll on by. This crash was tragic, not only because of the loss of life but also because co-pilot Andreas Lubitz’s mental illness may have pushed him to intentionally drive the airplane down. 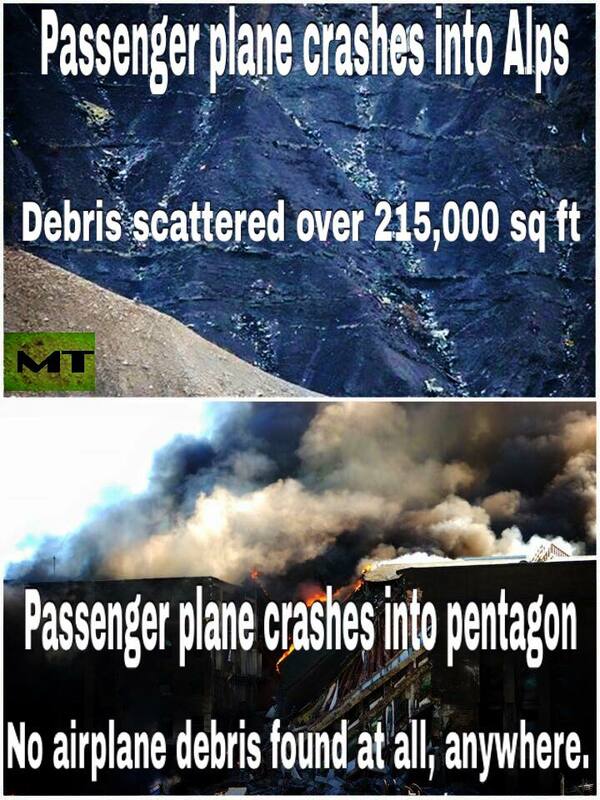 This meme claims that the debris from Flight 9525 was spread over 215,000 square feet, or roughly the same area as two city blocks. I suspect the terrain surrounding the impact site may have constrained the spread of debris, but it’s hard to say for sure. What kind of debris should one expect to see in the wake of a plane crash? Of course it depends on many factors, not the least of which is the intent of the pilot. When a pilot is trying to avoid a catastrophic crash, he focuses on reducing the plane’s speed (if possible). With less speed, the plane has less kinetic energy. It may break apart on impact, but the pieces will be larger. Whole engines or sections of fuselage may survive the crash. Since most airplane crashes are accidental, we’re accustomed to seeing debris fields featuring large, mostly-intact sections of the airplane – evidence that the pilot saw what was coming and did his or her best to mitigate the damage. But when a pilot is intentionally trying to wreck the plane, he does not slow down. The hijackers aboard Flight 77 intended to hit the Pentagon with full force; as a result, the destruction of the plane was total. The plane’s body was ripped into tiny shreds by the crash and ensuing explosion. If you can’t look at post-crash photos of the Pentagon and see huge chunks of airplane littering the lawn, it’s because the airplane was thoroughly reduced to small, twisted, scorched shards of metal. At the risk of sounding insensitive, complaining that no wreckage is visible in the post-attack photographs of the Pentagon’s west lawn is similar to complaining that no pine cones are visible in the same photographs. Furthermore, most of the wreckage would have been carried inside the building by the momentum of the airplane. There’s a well-known law in physics (well-known to everybody but 9/11 “Truthers”, apparently) called the Law of Conservation of Momentum. The Law of Conservation of Momentum states that the momentum of an object tends not to change, unless that object is acted upon by an outside force. If the object splits into smaller parts, each part carries a fraction of the original object’s momentum proportional to its mass. Furthermore, if that object collides with something else, the total momentum is spread out over all the bodies involved in the collision. In any case, overall momentum is conserved. When American Airlines Flight 77 struck the western face of the Pentagon, it had a lot of momentum. That momentum was spread out to millions of tiny pieces, each of which tended to keep moving in the same direction as the original airplane. Most of the airplane’s wreckage would be found inside the Pentagon building, because that’s the direction the plane was going. Are there photographs of plane wreckage taken inside the Pentagon building? Yes, but they’re not easy to come by. Most of the early photographs are private or government property and are not open for public viewing. By the time FEMA captured the first public domain images on September 14, much of the debris had already been cleared from inside the building. The remaining debris was torn, twisted, and charred to the extent that it was virtually impossible to distinguish from the rubble of the Pentagon itself. Sarah Roberts, writing for Rense.com, presents some of the publicly-available images. They show the chaos that can only result from an airliner deliberately being flown into a building. Debris is clearly visible; including a wheel hub characteristic of an airliner’s landing gear. The website 911review.com offers another critical analysis about why “Truthers'” claims vis-à-vis the Pentagon are all wet. The fact that the meme’s second statement can be so easily debunked by a moment of searching demonstrates “Truthers'” violent allergy to the actual truth. When their claims are shown to be flagrant falsehoods, many “Truthers” respond that they are “just asking questions.” What’s wrong with asking questions, man? Nothing’s wrong with asking questions, if you’re honest enough to accept the answers.